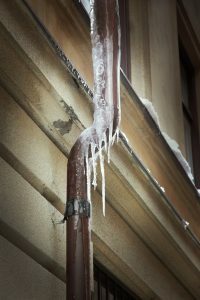 With the cold snap that has hit us in Minneapolis, I think it’s important that we talk about frozen pipes today! What should you do if a water pipe freezes? Obviously, the best answer is to make sure it never happens again! When the water freezes, it tries to expand inside the pipe. It pushes against the sides of the pipe, as well as any nearby valves, seams, and faucets. The freezing action of the water is more than capable of rupturing any pipe. Unfortunately, a water pipe may freeze even if you have taken precautions. Perhaps you lost electrical power for several hours, the temperature inside your house fell and the pipes froze. Or maybe you left on vacation, turned down the heat and weren’t expecting an early blizzard. Or perhaps your heat tape quit working, and you didn’t find out until you discovered none of the faucets worked. Bear in mind that a frozen pipe doesn’t leak – the water is ice. You’ll discover you have a leak only after the ice melts. If you’re not home, a ruptured pipe can cause a great deal of damage. CAUTION! : Before you try any of these methods, first open the faucet the frozen pipe supplies. The steam you create while heating the pipe can burst the pipe if it doesn’t have an escape. CAUTION! : Remember to use only heat tape certified by a nationally recognized testing laboratory for use with mobile homes. Be careful never to wrap the heat tape back over itself. This could cause the heat tape to overheat and start a fire. Method #2: Wrap the pipe with several layers of cloth or toweling and pour hot water over the cloth/toweling. Repeat several times until the pipe is unfrozen. Method #3: Direct a heat lamp on the pipe itself. Place the lamp at least a foot away from the pipe. Cover adjacent areas with a layer of aluminum foil so the heat does not scorch these materials. Make sure the heat lamp is on dry ground. Even better, plug it into a Ground Fault Circuit Interrupter (GFCI) outlet. Method #4: Hold a hand-operated hair dryer to the pipe, and slowly move up and down the length of the frozen section. Make sure you are standing on dry ground. Because you are working this close to water, plug the dryer into a GFCI protected outlet. CAUTION! : Do not use a propane torch to thaw out frozen pipes. Do not use a propane torch even if it has a fire spreader attachment. This is not only a fire hazard, but it’s also a quick way to destroy your plastic plumbing pipes. Method #5: if the area that is frozen is bigger than you can handle yourself, call 24Restore. We have several methods of bringing heat into your home to correctly thaw and stay ahead of any possible severe damage.